Combining the firelight and glass : The hand-blown lead-free Glass Carafe will not only impress wine, but your guests as well. 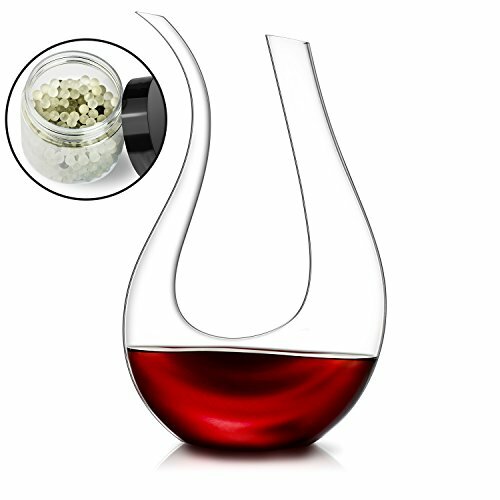 Perfect for any event, even for your personal alone time, this Wine Aerator Decanter will shine in the light and give your favorite beverage the elegance it needs to dance in style. Perfect for 750 ml bottle: pouring on of your bottle wine into the decanter it will actually reach the widest diameter and get the maxium aeration then you will get the best taste of the wine . Lovinpro aimed at giving best experience to glass lover. We meticulously iterate on design and materials to produce Hand blown glass exceptional quality. Lovinpro glass will not only add beauty to your home they also brilliantly combine stability, resilience, and astounding practicality. 100% Hand Blown Lead-free Crystal Glass - Hand-blown 100% lead free glass, this unique Wine Carafe is designed to hold a standard 750ml bottle of wine at the widest point of the wine decanters. Easy Pour Slanted Spout :Avoid spills & drips with our specially designed slanted top.The curved and slanted spout ensures that your wine effortlessly flows from the decanter into your glass leaving you to concentrate on pouring and drinking wine to your heart's content. Add elegance to your home bar :The design in this handmade and hand blown decanter adds an undeniable elegant touch to your home bar and/or living room. Using it as a beautiful showpiece or centerpiece on your table is sure to impress your friends and your wine & dine buddies.